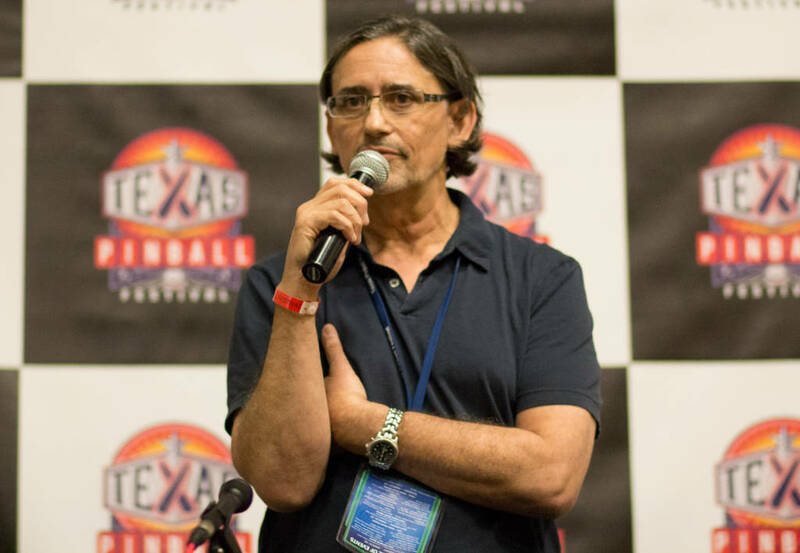 In an announcement today at the Texas Pinball Festival, Stern Pinball’s Chief Creative Office George Gomez announced that Brian Eddy has joined the company as a Senior Game Designer. George Gomez making the announcementBrian Eddy designed three games for Williams in the mid-’90s – The Shadow, Attack from Mars and Medieval Madness – but was also the programmer on several earlier games such as Black Rose, Bride of Pinbot and Indiana Jones. He left pinball after Medieval Madness, working on slot machines and on-line games, and has been the frequent subject of requests to return to pinball. Until now he has always rejected the possibility of making a return, but now Stern Pinball has employed his to work alongside Steve Ritchie, John Borg, Keith Elwin and George himself in designing games. George said Brian’s first title for the company is scheduled for release in 2019.